As my previous post alluded, things are very different in the Shiny & New household. One thing that has changed is the need for constant surveillance of our entire condo; so we installed closed-circuit TVs in every room so that we can always watch the new baby. In the spirit of openness this video is being streamed live to the internet at http://just.kidding/about_the_video. Ok, so there's no CCTV but we did buy a baby monitor. Make that several baby monitors, each of which we returned to the stores because they were totally unusable. The problem is that no matter how cheap or expensive the monitor there was always interference. Even with no sound transmitted from the baby's room, the parent-unit invariably made a hissing, screeching or buzzing sound. This makes the monitor useless since you can't sleep with that racket. Even well-recommended monitors like the Angelcare monitor, which monitors movements was useless when it came to the signal-to-noise ratio. 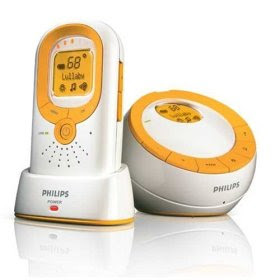 I despaired of ever finding a monitor but did a search for "interference-free monitor" and came across a boingboing article about the Philips Avent monitor. This article sold me and so I went out and bought the monitor. This monitor works as advertised: it is interference-free even in this wifi-, cell-phone- and cordless-phone-infested metal-frame building. The model I have (not the same as the picture) is a no-frills model but it works. Most of the time, when the baby's room is quiet, the parent units are totally silent. When a noise louder than a certain threshold is detected by the baby unit it begins transmitting to the parent units. This means you can sleep better during those rare times when the baby sleeps. The package I bought came with two parent units, which are cordless and portable. These came with batteries included and the setup was trivial: put in the batteries and press the power button to link it to the baby unit. The monitor I bought also has a convenient talk feature, where you can use the parent-unit like a walkie-talkie. It's handy but in a 2-bedroom condo it's not really needed. Still it saves us from shouting sometimes. The biggest downside is that this monitor was the most expensive monitor available. But given that the others were completely useless for me it hardly matters. Aside from that, it'd be nice to get movement monitoring. The only flaw I've found is that when the parent unit activates (because the baby unit detected a sound) the parent unit makes a clicking sound. This is a bit jarring. Posted by Mr. Shiny and New at 5/12/2008 07:30:00 a.m. I totally agree with you. This is a very good monitor. We have the same one in PK Land and have been very happy with it. My only beef is that, since we have it set to maximum sensitivity, the battery drains in about 2 or 3 hours.